–Everything tasted good. No fondant and no weird candy that no one likes. I wanted the whole thing to be completely edible and completely yummy. –No weird or ridiculously expensive ingredients. I wasn’t about to send you out to find marzipan or something. One great thing about these is that they can be done in steps. Make the cupcakes one day and freeze them in an airtight container. Make the frosting another day. Build the penguin bodies and then finish them off a few days later. It’s really pretty flexible. Also, you can use unfrosted store-bought cupcakes as well as store-bought frosting if you’re not up to doing this 100% from scratch. No matter how you do it, though, this is such a fun way to spend an afternoon with your kids (although probably your older kids) or a friend or even for a date if your husband/boyfriend/potential suitor can stand the sheer cuteness of it all. In a large, heat-safe cereal bowl or a small mixing bowl, combine chocolate chips and shortening. Heat in the microwave, stirring about every 30 seconds, until the chocolate is completely melted and flows easily. While chocolate is melting, insert a bamboo skewer about halfway into a flat end of each marshmallow. You can stick these into the craft foam while you wait for the chocolate to continue melting. Now…you’re going to want to work on about 6 penguins at a time. If you do any more than that, the chocolate will start to solidify and then you’ll have to whip out your blow dryer to melt the chocolate and then what was once a fun, snowy afternoon food crafty project will leave you wondering what in the world you’ve gotten yourself into. Working quickly (and holding the end of the bamboo skewer), dip each marshmallow into the chocolate and tap the skewer onto the side of the bowl a few times to remove excess chocolate (you may wonder if there is such a thing. Sadly, in this case, there is). Place the skewer holding the dipped marshmallow into the craft foam so the chocolate can dry without touching anything. When you’ve dipped about 6 marshmallows, wash your hands thoroughly to remove any traces of chocolate from your hands. Pour a small amount of sanding sugar/sparkly sugar/sprinkles onto a plate. 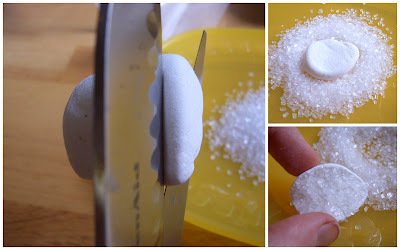 Using your kitchen shears, carefully cut a thin slice (about 1/8″) of marshmallow. Dip the sticky side (or just one side if both sides are sticky) into the sanding sugar and then carefully place the non-sugared side onto the dipped marshmallow. The melted chocolate will hold the marshmallow slice in place and the sanding sugar will keep yucky stuff from sticking to his tummy. Repeat with remaining dipped marshmallows. Next, take two candy corns per penguin and place them directly “above” (they’ll end up on bottom, though) the penguin’s tummy with the fat, yellow end poking out (these are his feet). You want to form a little “V” with the white ends so the feet stick out at an angle. This is a great stopping point–in fact, you can do this step a day or even two days ahead of time so you’re not completely overwhelmed. When the half-penguins are dry and you’re ready to continue working, go ahead and ice your cupcakes. The easiest and fastest way I’ve found to do this is to fill a large Ziploc bag with icing and then cut about 1/2″ off the corner and then just squeeze the icing onto the cupcakes. The recipe I use perfectly (for this recipe, anyway) ices 24 cupcakes. After you’ve squeezed all the icing from the bag, spread it across the surface of the cupcake with a butter knife. Place a semi-penguin on each iced cupcake and gently press some coconut around each penguin body (for snow). If you’re allergic to or don’t like coconut, you could also use some more sanding sugar instead of the coconut. You’ll probably need to reheat your chocolate at this point. Heat it until it’s liquid and then give it a good stir. Dip each Trolli Strawberry candy into the chocolate and then twirl it a little to remove the excess chocolate. Carefully place the dipped candy onto the penguin’s body, the oblong side directly above the penguin’s tummy (this will be his face). Next, wash your hands really well again and then open the yellow and/or orange Starbursts. Now…a little Starburst will go a long way here; in fact, I only used two Starbursts for 24 cupcakes, so keep that in mind. Carefully cut off a small piece of the Starburst (maybe a 1/8″ corner) and then form it into a beak between your fingers. Carefully place it in the middle of the penguin’s face (the chocolate on the head will still have to be warm for this to work). Next, place the cube of almond bark into one of the small Ziploc bags and seal it. Heat it in the microwave for about 1 minute, checking it every 20-30 seconds (and mashing it around with your hands a little each time), until the bark has melted. While the almond bark is melting, scrape the excess chocolate from the dipping into the other small Ziploc bag. Reheat it a little if you need to. Cut a TINY hole in the corner of each bag and then carefully dot each penguin head with two bloops of melted almond bark. And that’s it!! Like I said, these are a lot of work, but if you’re patient and careful, they’re pretty darn difficult to mess up. And really, if you go straight through from baking your own cupcakes to decorating 24 penguins all in one day, it’s about a 3-4-hour project, which isn’t REALLY the end of the world and would be shorter if you had someone helping you. Also, I think 12 penguins is a perfectly acceptable alternative… 🙂 You’ll cut down on that time considerably if you buy the cupcakes (or make them in advance) and if you take a break after you’ve made the base for the penguins. However you do them, they’re definitely going to impress whoever you take them to, whether it’s a classroom full of kids or if it’s a holiday party for adults! saw you on studio 5. great job! the cupcakes are too cute! i will attempt them for christmas. Awwww,these are too cute to eat! OMG! These are fantastic, just fantastic. But then that's the nature of penguins, no matter what form. These might be a lot of work but they are GORGEOUS!!! I'd do it! In fact, I just might! I have to make these for my niece! Those are so cute, I'm just going to have to make some! Thanks for such an easy tutorial!!! These are ridiculous amounts of cute! I am bookmarking these!!! Too cute I will have to make these with the kids while they are on Christmas break! I wish I had kids… I'm sure they would enjoy these more than my boyfriend! Hahah! These cupcakes are just too cute! These are really cute and would be great to take to our ward Christmas party on Friday! I love your blog site, it is so fun. We tried our first recipe last night and it turned out great! Thanks! Ooooh! What a fantastic idea! Very Cute! you are so Clever! Those penguins are super cute! Don't know if I am that ambitious. I was just on the Pioneer Woman's site and you guys were in her list of top 20 food blogs that people read I thought that was pretty great, congratulations. I also came to tell you that I saw you on PW Cooks! How cool! If I remember correctly you both love her site. Can you believe that you were in the top 20? WOW! That's up there with Martha, Smitten Kitchen, and more! WOW! Cool. Love this ideas! You gals are so freakin creative! That's cute! That white spot in the front is needed, otherwise they look a bit phallic. I just finished making these for my daughter's kindergarten birthday party! They turned out pretty darn cute, they would have been perfect had I been a little more patient 🙂 I used a few shortcuts that might be helpful for others if they are for a group of easy-to-please kiddos – I used the ready to melt tubs of dipping chocolates that you just pop in the microwave, they worked great and seemed to stay melty for a long time, plus clean up was a breeze. One tub decorated 19 penguins. For the eyes, I used the packages of cookie frosting with the small tip (white) and the black decorator gel for the iris. It worked great and was easy! Thanks SOOO much for the idea, my daugher is incredibly excited to take these to school! I just love Our Best Bites!!! SO excited about the meat pies! I went to Kenya in July and we were served these as a special treat. I was a little leery about trying them, but when in Kenya…. That is so freakin cute!!! My linux loving husband is going to love that. Thanks for the inspiration!!! Love your blog! I came across these while browsing your site because I have not been disappointed once! If you put out a book I will BUY SEVERAL! I love the penguins and think the sweets you used to create them are really great. I need to buy some of the Trolli Strawberry candies. I haven’t tried them, but they sound yummy. I might swap out store bought candy eyes in place of piping on the eyes just to make it even easier. So cute! I love these…I have 2 in pre school and they are learning about penguins this week…making them for tomorrow! Im gonna heed the advice and buy cupcakes…and we have the big campfire marshmallows, and mini chocolate chips for the eyes. also if you cant find candy corn (like me) Im gonna use the orange slice candies….thank you! I know the kids will be excited! Very beauttiful and delicius!!!! :D!!!! Omg…these are too adorable not to make. I can’t recall the last time I said “Eeek!” as I looked over a recipe. I’m going to try making these for Easter and alternating a bit. Instead of milk chocolate, I’m going to *try* white chocolate for the body…and if I’m feeling daring, I might add some yellow food dye. They look so delicious too. You are amazing for coming up with these!! I only hope mine will turn out as nice. Okay, I need to close the window b/c I can’t stop looking at these lil guys. (Does that mean I have a problem?) Lol. Thanks for sharing, and look forward to more recipes! I think that these are so cute and I do a lot of cupcakes on special birthdays and other occasion so this is a great idea. I will keep this in my records for future use. ❮ Previous Post Previous post: Chili Spice Mix: Ready for Gift-Giving!